Many print fanatics are suckers for gloss varnishes, metallic foils, velvet finishes, neon colors, and lenticular images. Personally I, and many others are also advocates for digital print. Yet, for much of production, color digital print is process color only. Cyan, magenta, yellow, and black are classics, and they are perfect for many jobs, but sometimes the consumers want more. 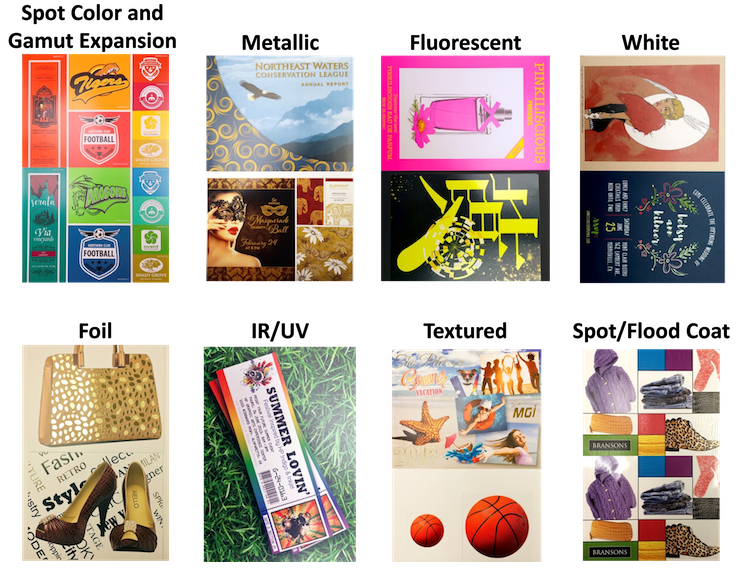 InfoTrends estimates that 30% of offset prints in color have some type of enhancement beyond the four process colors. This process is often referred to as “CMYK+". The process of CMYK+ may be a spot or flood coat, a Pantone color, a metallic gold or silver ink, opaque white, or a range of other special effects. Sometimes print will even use a combination of two or more of these effects. All in all, this amounts to more than a trillion color offset pages that have some type of an enhancement beyond process color in promotional document applications. Some of the CMYK+ digital print pages are done in-line with systems that have an extra imaging station in addition to cyan, magenta, yellow, and black. HP Indigo, Kodak NexPress, and Xeikon were some of the earliest system providers to offer digital enhancements beyond CMYK, but others have come to the market with such features more recently including systems from companies like Fuji Xerox, Oki Data, Ricoh, RISO, and Xerox. There are also off-line digital enhancement systems from companies like Konica Minolta, MGI, Scodix, and Steinemann that use UV inkjet to produce spot gloss, dimensional, foil, and other effects. Yet today, the digital print enhancement market (both in-line and off-line) only amounts to about nine billion pages annually. That may seem like a lot, but it’s just a tiny sliver compared to the total 1.8 trillion print-enhanced color pages produced each year. The conclusion is pretty clear: there is a significant growth opportunity for digital print enhancement processes. One of the reasons for this opportunity is simply to add value to digital print pages, but there is an interesting synergy between digital print and CMYK+ special effects. First off, CMYK+ allows high-value effects to be done affordably in shorter runs and with quicker turnarounds than with conventional methods. The personalization capabilities of digital print also make it possible not only to add the special effect, but also to make each and every printed piece unique. To explore the size, scope, and growth prospects for digital print enhancement, InfoTrends conducted a market study last year called “Beyond CMYK: The Use of Special Effects in Digital Printing.” This study includes a forecast plus research that was conducted with three key groups: print service providers, print customers, and system vendors.